Nablus The Palestinian city of Nablus is located in a narrow valley between the two mountains Gerizim and Ebal in the northern West Bank, approximately 63 kilometres (39 mi) north of Jerusalem, and has a population of 134,000. The city of Nablus was founded in 72 CE by the Romans and was soon settled by Semitic tribes. By 480 CE Christianity was flourishing in Nablus and by the end of the 6th century, Nablus was considered a major site in the Holy Land. Arab-Islamic rule that came shortly afterwards led to the city being dubbed “Little Damascus”. The 19th century brought with it economic prosperity for this area with traditional industries including the production of olive oil soap and cotton processing. Nablus continued to be a city of economic importance in the 20th century for Palestinians. Once the economical and financial driving force of Palestine, Nablus has been a central flashpoint of violence between the Israel Defence Forces (IDF) and Palestinian militant groups. The level of violence dramatically increased from 2000, at the start of the Second Intifada. During the various military operations, Nablus city stayed under curfew for a total of 240 days forcing its residents inside. The longest period was between April 2002 and November 2002 when the city was under curfew for 151 days and the curfew was only lifted every few days for a total of 65 hours. Since the second Intifada, Nablus has been closed off by seven Israeli checkpoints encircling the city and being reason for ‘devastated’ economy and high unemployment. Only in 2008 the checkpoints were declared “open” (NOT removed) allowing a discreet economical revamp. The Old City of Nablus The Old City composed of six major quarters: Yasmina, Gharb, Qaryun, Aqaba, Qaysariyya and Habala, has five main commercial streets. Its spine, Al-Nasr Street, connects it to the east and west sides of the expanded modern city, with parallel and connecting smaller streets. In spite of the current recession, the streets, lanes, and souqs are still rich with merchandise, busy with shoppers and life. 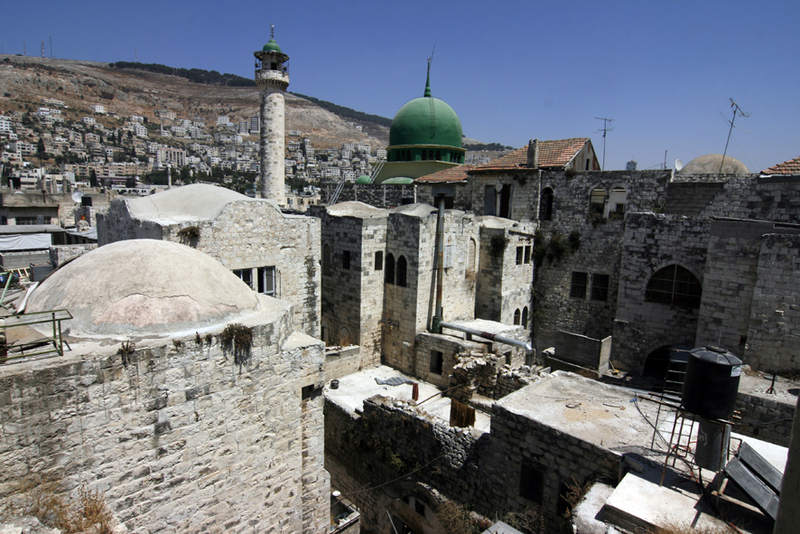 Surrounded by densely populated residential quarters, there are 12 historic mosques in the old city (built or rebuilt during the Omari, Ayyubid, or Ottoman eras), two churches and a Samaritan synagogue, in addition to a number of mazarat, maqamat, and zawaya. Traditionally known for natural soap-making from olive oil, the old city contains over 20 soap factories. Some are still in use, others are abandoned, and sadly, three were devastated during the Israeli invasion of 2002. Of its eight traditional hammams, only two are in use. In the almost 10 years of siege, between 2001 and 2010, the Old City was among the most affected area of the city and suffered most of the destructions and victims. During this period, the Old City of Nablus became the scene of heavy fighting and intense IDF shelling, and a number of historic buildings from the 1st to 15th century were severely damaged. More then 1500 houses and buildings were destroyed or damaged by the IDF, mainly between 2001 and 2008, of which, 25% have been totally demolished. Currently, of the circa 35.000 inhabitants in the Old City, 65% live under the poverty, unemployment in the Old City and in the refugee camps is estimated to be as high as 80%. The Women An important dimension of the Israeli-Palestinian conflict concerns Israel’s control over the movement of Palestinian people, goods, and resources. Extensive and multilayered, the apparatus of control has turned the West Bank into a fragmented set of social and economic islands or enclaves cut off from one another. Massive economic declines lead to a drop in male employment. In response to male retreat from the labor market, women have had to step into the public sphere and employ strategies to prevent family destitution and aid dependence. The difficulties the women have faced include unequal pay in low-status and unprotected jobs, limited education, business inexperience and the restrictions placed on women in a patriarchal society moving in traditionally male fields have all added up. Given the overall conflict environment that is leading to high unemployment and poverty, violence has intruded into the everyday lives and in the domestic sphere of Palestinians, affecting primly women and children. The economical conditions above described are, in the city of Nablus, worsen by the accentuated conservative environment that directly affects the public outreach of women; In this framework, the women sphere of the Old City of Nablus seeks opportunities for self-employment and building capacity in order to face the widespread economical difficulties and respond to the need of capacity building and self-confidence in acquire economical independence. Moreover, the Old City of Nablus offers no recreational centres and places for aggregation for women, consequently, not many opportunities are given to women to socialise and share psychological and social struggles. The development of local institutions for community empowerment ultimately can be a good source of involvement and experience for youth, both male and female. These can lead to greater social cohesion and community building and instill positive changes in attitude toward and practice of gender roles.